The Sir Vivian Richards Stadium in Antigua won't host international cricket for at least 12 months following the abandoned second Test against England in February. The match lasted just 10 balls because of an unfit outfield and the ICC has told the West Indies board that extensive work is required to bring the ground up to standard. It will then have to pass an ICC inspection. 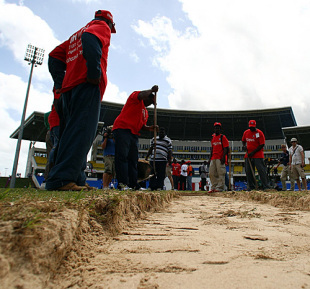 The WICB has also been given an official warning by the ICC for the standard of the ground after the outfield was so sandy that the bowlers couldn't gain any traction. Jerome Taylor and Fidel Edwards managed 10 deliveries between them before the captains and umpires came together and decided to end the match. "We accept the ruling and are prepared to move on," Donald Peters, the WICB chief executive, told Cricinfo. "We are confident of being able to work with the Antigua Cricket Association and the government to bring the ground up to international standard." The problem stemmed from the outfield being relayed last year to incorporate a new drainage system and it was clear from before the match that the surface would be a major issue. The inspection will take place no sooner than 12 months from March 16. Dave Richardson, the ICC's general manager - cricket, admitted the situation had done nothing for the sport's image. "The abandoned Test match was an embarrassment to the local authorities in Antigua, to West Indies cricket in general and to the international game as a whole. "The image of the game and the integrity of our sport cannot afford to have such farcical scenes play out as they did on the first morning of the match. Steps must be taken to ensure that it never happens again. "The responsibility for delivering a venue fit for international cricket rests with the member board. This requirement has been agreed by all the members and was reaffirmed by the ICC chief executives' committee meeting in Johannesburg last month." Following the abandonment the Test was subsequently moved in 36 hours' notice to the Antigua Recreation Ground, which hosted its first Test for three years. The match ended in a nail-biting draw as West Indies hung on in fading light with their final pair at the crease. Peters added that he hoped once the work was completed at North Sound that Antigua will have two first-class venues and said that in the short term they would look at using the ARG again. "It would be down to the ACA, but hopefully there will be something in place."